A proclamation is an official document endorsed by the entire St. Johns County Board of County Commissioners to commemorate a specific time period, event, or accomplishment impacting a large number of St. Johns County, Florida, or United States residents. They may also be given for the purpose of raising awareness about an issue, to celebrate a milestone, or serve as an expression of support for individuals, community organizations, and businesses. The St. Johns County Board of County Commissioners occasionally hosts presentations to commemorate an achievement, raise awareness about an issue, or recognize an organization. Presentations could also include a proclamation or a certificate of recognition. When and Where do Proclamations and Presentations Occur? 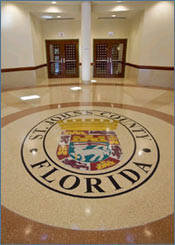 Proclamations and presentations typically occur at the beginning of regular St. Johns County Board of County Commissioners meetings, which occur at 9 a.m. on the first and third Tuesday of every month in the County Administration Building Auditorium, 500 San Sebastian View. Once adopted by the Board of County Commissioners, proclamations can also be presented outside of a regular Board meeting, at external meetings or events, and through electronic correspondence or regular mail if appropriate. A certificate of recognition is a document presented by the Board of County Commissioners, an individual Commissioner, or St. Johns County Administration for the purpose of recognizing a specific time period or event, raising awareness about an issue, to celebrate a milestone, or act as a letter of support or endorsement for an initiative of significance for individuals, community organizations, and businesses. How are Certificates of Recognition Presented? Certificates of recognition do not require Board approval and can be presented by the entire Board of County Commissioners, an individual Commissioner, or a representative from County Administration during a Board meeting, at an external meeting or event, and through electronic correspondence or regular mail if appropriate. St. Johns County proclamations, certificates of recognition, and presentations may be requested by completing and submitting the online form below to the St. Johns Board of County Commissioners. Once the form is received, a St. Johns County staff member will be in contact to provide confirmation of receipt, and if approved, a presentation date, and details of the event. Please submit proclamation, certificate or recognition, and presentation requests a minimum of four weeks in advance in order to allow adequate time for the request to be reviewed and approved. Reasonable attempts will be made to accommodate all requested dates. Parties requesting a proclamation are required to provide a draft of the requested proclamation in the space located within the request form. Please review these sample proclamations for general guidelines. Parties requesting a certificate of recognition are required to provide a description of the request and any associated language that would be included on the certificate. Please review these sample certificates of recognition for general guidelines. Proclamations must be a maximum of four "where as" paragraphs in length consisting of no more than two sentences each. St. Johns County reserves the right to edit, modify, or deny any proclamation, certificate of recognition, or presentation request. If a proclamation has been issued in the past, a new form must be submitted for each reoccurring request. In the case of proclamations that occur annually, a new request must be submitted each year. Proclamations and presentations must be of significance, interest, or relevance to St. Johns County residents, businesses, initiatives, or programs. Individuals requesting proclamations, certificates of recognition, or presentations must be clearly associated with the entity, person, or subject matter being honored. Proclamation and presentation requests are approved at the discretion of the Chair of the Board of County Commissioners. Certificates of recognition may be presented by individual commissioners or a representative from St. Johns County Administration at their discretion when appropriate. Please contact the St. Johns County Communications Division at (904) 209-0549, for additional information.